According to the Old Farmer's Almanac, the January full moon is called the Wolf Moon. The Ojibwe refer to it as the Spirit Moon, the Cree call it the Frost Exploding Moon and the Tlingit call it the Bear Hunting Moon. To me, it shall now be forever known as the Coyote Moon as our resident coyotes' eyes glowed nearby from the light of my headlamp while I photographed the eclipse behind one of my favorite saguaros on our Sonoran Desert property. Photographing a lunar eclipse is pretty straightforward once you determine where the moon will rise, where and when the partial eclipse will begin and reach totality relative to your camera position. 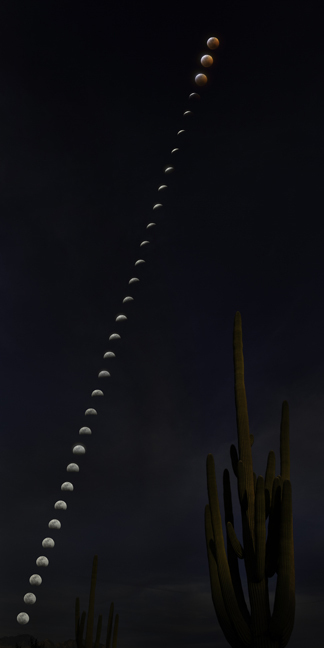 The saguaro was photographed at sunset with a wide-angle lens and the eclipse sequence was shot with a telephoto lens from the same perspective beginning shortly after moonrise. Occasional clouds made it more challenging to balance exposures and maintain exact intervals between each exposure, but as it's an artistic representation and not a documentary photograph. The next total lunar eclipse is not until May 2021, so just consider it artistic license.